Last day to file your objection in court—and we’ll file objections in the street! Calling on all City of Detroit retirees, current City workers, residents and other concerned people for a mass protest outside the Federal Courthouse in Detroit (231 W. Lafayette St.). Emergency Manager Kevyn Orr has a “Plan of Adjustment” that will loot the pension funds to pay off the bankers. 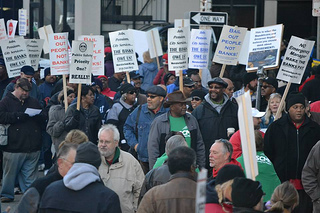 90% of the bank debt owed by City of Detroit will be paid 100%. Only a small percentage of lenders will take a hit. Meanwhile Orr wants to give $85 Million to Bank of America and UBS as a reward for illegal bond swaps—but they stole over $300 Million from us through these swaps over the past 6 years. Fight back or starve! That is the choice for over 20,000 retirees. Health care has been eliminated for those under 65. Now they want to take 34% of the little retirees get after decades of loyal service. The plan of adjustment assures that no banker will miss a meal, but for retirees it’s a death sentence. There is plenty of money. Gov. Snyder is withholding hundreds of millions of revenue sharing owed Detroit. Orr could sue BofA, UBS and other big banks to recover the $300 Million they stole in the pension swaps deal and over $500 Million in ill-gotten gains via the Water Department bond swap. The banks who destroyed our cities with racist predatory loans have been fined $50 Billion by the federal government (Chase Bank paid $13 Billion alone!). Detroit should get some of that huge sum as restitution for destroying our neighborhoods. The City will pay ZERO into the pension fund for the next 10 years, depending entirely on charitable contributions which are not guaranteed. Cost of living increases are to be eliminated. Orr wants to make retirees pay back 34% of what they’ve already collected since June 2013 and take back some annuity money from retirees going back to 1999! Only a MASS MOVEMENT will stop this terrorist conspiracy. Civil and worker rights were affirmed by the courts only after the mass struggle forced them. Lawyers in the courts need the support of thousands in the streets to drive home the point – this is UNACCEPTABLE.